$4 Off Pet Supermarket Printable Coupon (or Where Accepted as Competitor)! 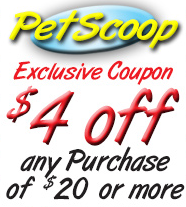 Here’s a high-value $4 OFF Pet Supermarket Printable Coupon good thru 7/31! My Petco accepts this as a competitor and allows stacking, so I’m going to use this along with the $5 Off Petco Printable Coupon I posted a few days ago to save $9 off my next bag of dog food for Daisy. You can signup at Free Coupon Alerts for notifications of more printable coupons!